This is the first of a series of drawing lessons in which we’ll draw our hands. 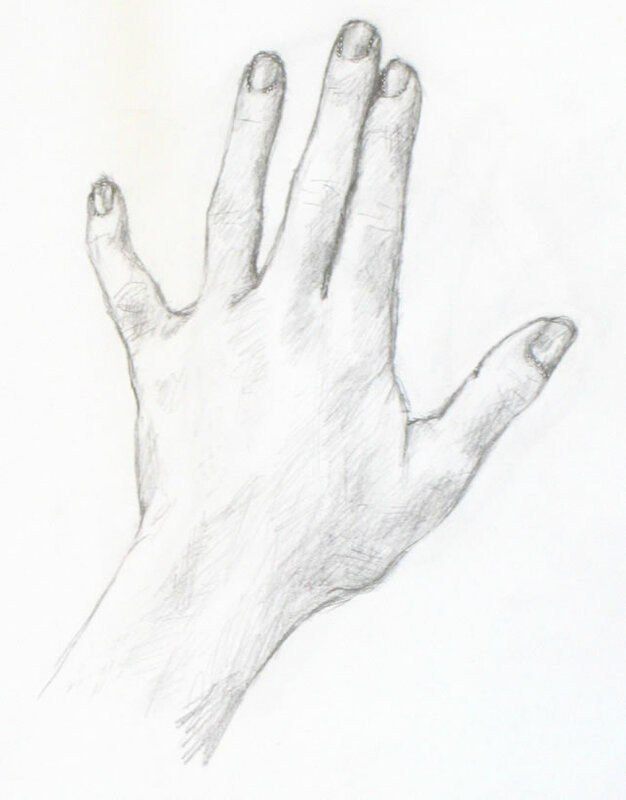 Finished basic sketch of hand. I chose hands because they are always available to “pose” for you! And they can be placed in an infinite variety of simple or challenging positions. The techniques you’ll learn from these lessons can be applied to drawing anything and everything else. This first lesson is a simple drawing of the back of your hand. This is the hand at its most basic, with no odd angles or foreshortening. Future lessons will become more complex as we go along. You can use any kind of paper. I used plain printer paper and a Papermate “Sharpwriter” #2 pencil. These are very unsophisticated materials, which I love using to practice drawing. They’re easy to find, so you can do a quick sketch any time you have a bit of free time. First, tape a piece of paper to a table where you’ll have space to put your non-drawing hand next to it. Place your non-writing hand (your left hand if you’re right-handed and vice versa) next to on the table very close to the paper. You will need to stand up while you sketch so that you’re viewing your drawing (and your hand) from directly above. If you sit down, you’ll be seeing your paper at an angle, which will make you distort your drawing. Alternatively, you can use an easel, either a table easel or a free-standing one. 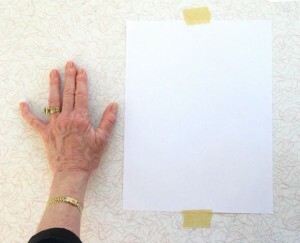 You will then need to place your hand vertically on the easel so you’re viewing it from the same angle as your paper. Ideally you should stand up while you draw, whatever you’re using. Standing will give you most perspective so you can do your best work. Place your fingers as I've done here: first two close together and the others separated by different amounts. Place your hand with the first two fingers touching each other, really snuggled up together. Your ring finger should be somewhat separated from the first two. Your pinky should stretch out at a more distant angle. Place your thumb with a good space between it and the rest of your fingers. These differing amounts of space between your fingers will help you see the “negative space” between and around your fingers and hand. You can read more on why this is true here. To me, the ability to see negative space is the key to drawing anything. Focusing on the space around what you’re trying to draw tricks your eye into seeing more accurately. It’s an extremely important skill for you to develop! First, look carefully at the space between your pinky and ring fingers. It’s roughly a triangle. 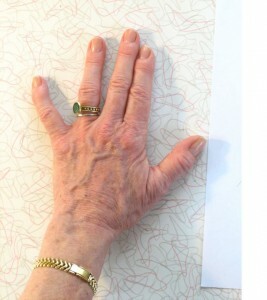 The top of the “triangle” is created by an imaginary line connecting the tops of the two fingers (we’ll erase this line at the end of sketching the entire hand). I’ve placed black lines on top of the photo of my hand to help you see this. Don’t look at the fingers themselves! Forget that you’re drawing fingers. Focus on the space between the fingers and draw it, as I’ve done in the middle image below. Form each angle of the shape as accurately as you can. Then move on to the triangle between the next two fingers, as in the far right image below. Begin by drawing the spaces between your fingers. Don't look at the fingers! Focus on the spaces between them. The “triangles” are each tipped at a different angle. Be sure to draw your “triangles” tipped just the way they are in your hand. Between the next two fingers is a line (see below), not a space, because of the way we’ve placed the fingers. Look at this line carefully and replicate it in your drawing. At the top of the pointer finger is a little tiny triangle formed against the middle finger. Between the first two fingers is a line. There's another large sort-of triangle formed by the thumb. Now sketch the sort-of-triangle between the pointer and thumb. You can see that I made a mistake in drawing my first line. My second, lower line is more accurate, but for now I’m leaving both. We want to keep moving forward quickly, and will erase mistakes later. Next I formed the edge of the pinky finger (see below), again envisioning it as a triangle, this one long and almost flat. I have an odd little crook in my pinky from slamming it in a hotel balcony door a few years ago. It’s a bit sad, but I’m using all its angles to help in my drawing. The outside edge of the pinky is formed by visualizing another triangle. The edge of the thumb uses reference lines (dashed), one of which I drew, others which I just envisioned. Moving on to the bottom line of the thumb and hand: To help figure out where the line should cut in to form the wrist, I drew a faint vertical line from between the first two fingers downward. You can see this very light line in my drawing (farthest right, above). Because of the particular position of my hand, my wrist appears to emerge not from the center of my hand, but from the area beneath the ring finger and pinky. Sketching the light vertical line helped me draw the wrist where it actually is. I then captured the ins and outs of the bottom line of the thumb and hand by visualizing more imaginary reference lines forming right angles with the top of the thumb (drawn in dashed lined on the photo of my hand, left above). Another time, I might have sketched this line using a triangle visualization, as I’ve been doing up to now. There’s no right or wrong here. The more of the hand you draw, the more reference points you have to judge where your next lines should go. You should use whatever reference points enable you to see where the line is in reality, hence where you should draw it on your paper. Positive space can be negative, too! Now that we’ve completed the outline of the hand, are we finished with negative space? Not at all! Let’s take a look at what happens when we begin to sketch in fingernails. Nails and finger tips can be envisioned as negative space for each other. Here we’re repeating the same kind of process we used to draw the negative space between the fingers. Here the fingers around the fingernails are the “negative space” of the nails. Seen another way, the fingernails are the negative space of the tips of the fingers surrounding the nails. Draw each nail carefully. Observe how much finger appears on either side of each nail – they are all different! If you draw them all the same, according to some idea of where the nails “belong,” you will miss an opportunity to make your drawing appear three-dimensional and real. For example, the nail on my ring finger (above) has almost identical bits of finger tip around it. But my middle fingernail has more finger tip on the right side than on the left. And my pointer nail has hardly any skin showing on its left. Notice the different angles and shapes of top and bottom lines of each nail. They are all different: my middle nail appears to have a shallower curve at the bottom, while my ring finger nail has a deeper curve at the bottom. You need to draw each of them as they really are, not as you think they should be, if you want to create a realistic drawing. The process of adding shading is very much the same as what we’ve been doing all along: seeing shapes and areas in relation to each other. The only new thing we’re adding now is learning to see values – which shadows are darkest? Which are barely there? The best way to judge where you should shade is to squint your eyes so that you see only the most basic areas of light and dark. This is easiest when you have a strong light source that throws deep shadows. But even minimal shading can be detected by squinting hard. On the photo of my hand below, I’ve drawn dotted lines around areas of shade that I first noticed and shaded in with my pencil. To see areas of light and dark, squint your eyes really hard. As I shade in, I also continue to refine the outlines of each finger and the hand, adding the subtle variations to the rough “triangles” I sketched at the very beginning of the lesson. Looking for shadow and light helps me see details of the outline as well. You can see how I worked through this in the very short video below. You’ll need to watch it through several times because the changes are subtle (next lesson I’ll use darker drawing tools so you can see more clearly). As you work, keep looking and looking at specific areas and at your entire hand as a whole, comparing dark and less dark shadows. Pencil more heavily in areas – such as the line between the pointer and middle finger – which are very dark. Use a lighter touch for lighter shadows. Note super-light areas by squinting hard. If they’ve gotten too dark, you can use the edge of your eraser to lighten them. Even your nails have highlights and shadows. Try to see and replicate them accurately. Look at the nail beds – the skin touching the nails. It’s shaded in some places and light in others. I made all my nail beds too dark, so I lightened them at the very end. I hope you’ve enjoyed and learned from this lesson! We’ll do a different view of your hand next lesson. My goal in my drawing and painting demo posts is to provide insight into the moment-by-moment decisions made by artists during the flow of creating their art. You can follow their process step by step, and then try it yourself. 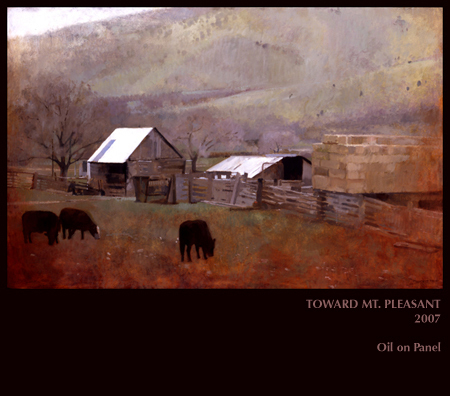 An example of J. Kirk Richards' evocative full-size landscapes. As in his demo paintings, the cows drawing nourishment from the peaceful earth bring emotion to the painting. 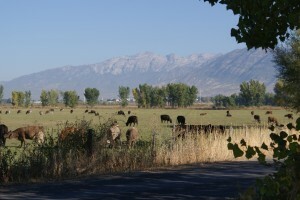 I recently asked Utah artist J. Kirk Richards to create a video demo for this blog. He agreed and filmed the lovely plein air (outdoor) painting demonstration below. He included sound commentary to explain the choices he made as he worked. The two paintings in Kirk’s demo are very small – little jewels. He painted them without drawing or extensive planning first, blocking out areas of color over a midtone background. I’ll talk more below about why this initial midtone layer of paint adds so much to both finished paintings. Photo of scene from which Kirk Richards painted his demo. 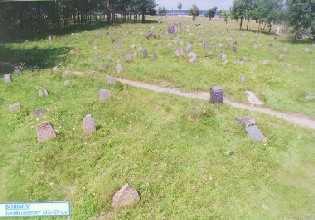 Note the row of trees, one of which Kirk included in the center of his first painting. I want to draw your attention to a couple of the techniques Kirk draws on in his demo. As you watch the video the first time, observe that he uses a palette knife at certain points rather than a paintbrush. We’ll talk more about this and another technique after you watch the video. Kirk explains that when he uses the palette knife, he’s applying thicker paint to make the tree and grass highlights more luminous, to give them texture and body. The heavier, more intensely-colored bits of paint in these areas evoke leaves and the sheen of sunlight across the grass. Still of "Morning Shade," painting #1 in J. Kirk Richards' video demo. 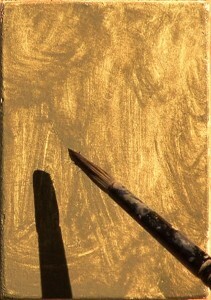 The second technique – a very important one for you to experiment with yourself – is the initial painting of the entire panel with a warm midtone. Two elements of this base layer are vital to the finished painting: texture and color. At first it may be easiest to detect the texture of the underpainting, especially in painting #1 (left). Look at the area on the left side of the painting, between gray sky and yellowy-green grass, which has almost no overpainting at all. 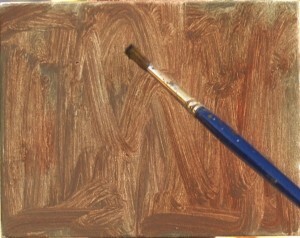 The roughness of the warm brown midtone base layer suggests a bank of foliage bathed in light. Even more impressive is the way the scratchy underpainting captures the large central tree’s leaves, scraggy branches, and rough, sunlit bark. 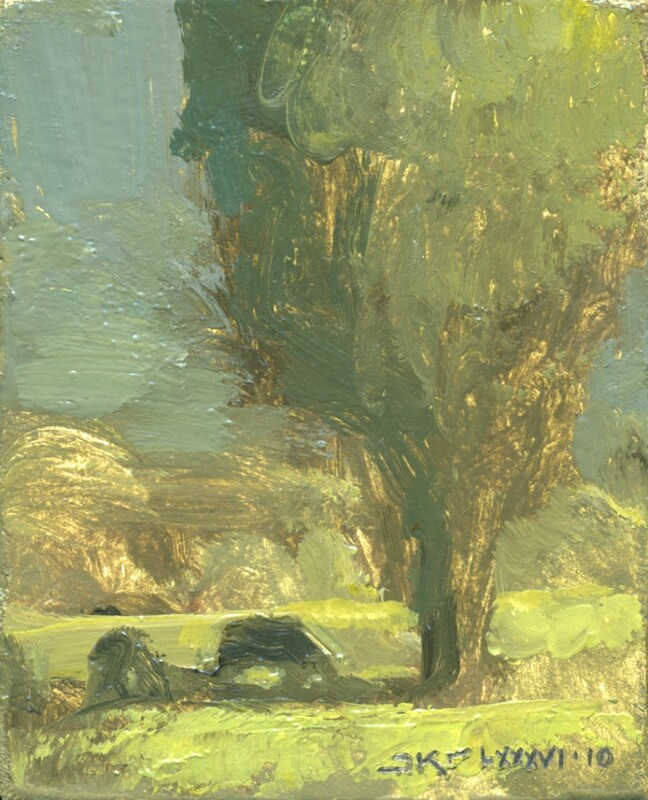 Where the brownish brushstrokes are very light, they look like sun backlighting the tree. Where the brushstrokes are dark, they look like shadows under leaves and bark. Painting #1: Kirk applies the midtone base. It’s part of the artist’s magic that Kirk’s first random brushstrokes seem to have fallen in exactly the right places to form both the large, detailed foreground tree and the hazier background foliage. In my own realistic painting, layering of color is one of my two or three most important tools. Even though my brushstrokes are generally very flat (never thick like Kirk’s palette knife application), the layering of color is what creates three-dimensional appearance. While many viewers may not be aware that they’re seeing multiple colors visible through the top layer, this is what gives the optical illusion of vibrant three-dimensionality. 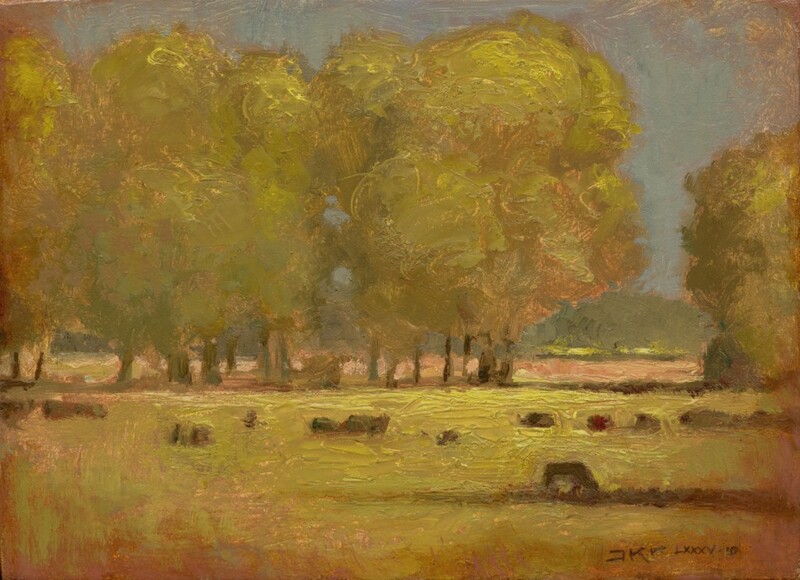 In the two paintings in Kirk’s video, the color of the initial layer of midtone paint creates depth and luminosity as it plays off layers added later. Take a few minutes to carefully study demo-painting #1’s base layer (above). Notice that it’s an ochre-y brown that appears rosy in its own midtones and cream in its lightest areas. This range of color contrasts with all the layers of flatter color painted on top of it: gray, chartreuse, olive, yellow. Painting #2: Kirk applies 2nd (reddish) layer of midtone base paint. All the contrast in color and texture between the base layer and later layers are what give the painting depth and a feeling of sun skimming the grass. The fact that the sky in the finished painting is gray, not blue, makes the yellow-green of the grass appear brighter, hence more sunny. Now turn to demo-painting #2 (left). It actually has two midtone base layers. The first is a gray-brown. Kirk then painted over this with a reddish midtone. Look carefully at the completed painting #2 (below). Scan your eyes over it in detail, observing all the areas where the rosy base layer shows through the gray-blue sky and chartreuses of later layers. This rose color suffuses the finished painting with a warm, elegiac glow. Without this perhaps unexpected rosiness, the painting would appear flat and boring. J. Kirk Richards' palette colors for his video demo. When I asked Kirk to email a list of colors he used in his demo, he sent the image to the right. Colors from left to right are: Raw Umber, Burnt Sienna, Raw Sienna, Naples Yellow Deep, White, Cadmium Yellow Medium, Cadmium Red Deep, Alizarin Crimson or Permanent Madder Deep, Prussian Blue, Black, Greenish Umber, Transparent Yellow Green. 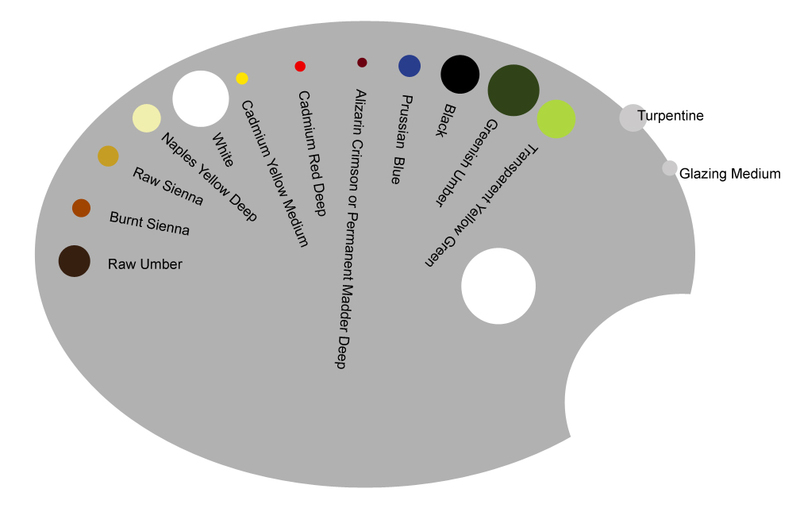 The size of each color in the graphic approximates the relative amounts Kirk used for the two paintings in his demo. Kirk used some of this vocabulary in two lovely portraits. 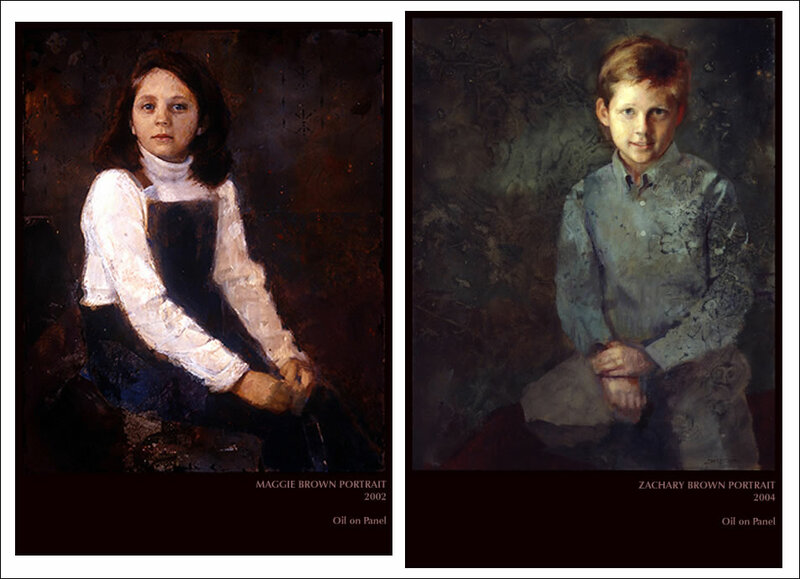 Note in each – particularly the one of the boy – the face is rendered in a smoother, more detailed way than the rest of the painting. I’m generally not a fan of portraits in which everything except the face is sketchily rendered. But Kirk is doing something different here: he’s put as much thought and detail into the background and clothing as he has into the faces, even though they’re more roughly painted. Kirk’s dark backgrounds and clothing don’t look flat. They are rich, full, dimensional. To me this conveys the feeling that darkness in our lives can be a fertile background from which light can develop. Despair, handled properly, can eventually nurture growth and happiness. Whether or not you’re religious, this is a deeply meaningful thought. Last, I want to draw your attention to the facial expression of the girl, Maggie. Anyone who has read my portraiture posts knows I feel facial expression is the single most important element of a portrait. Kirk has painted Maggie with an intense, thoughtful expression that I find intriguing. Although her gaze is slightly averted from the viewer, we can see that she’s highly engaged with thinking about something. In fact, I almost feel she’s attending to a sound she’s heard. As such, this is one of the only auditory portraits I’ve ever seen, in which the subject appears to be listening, not just seeing.